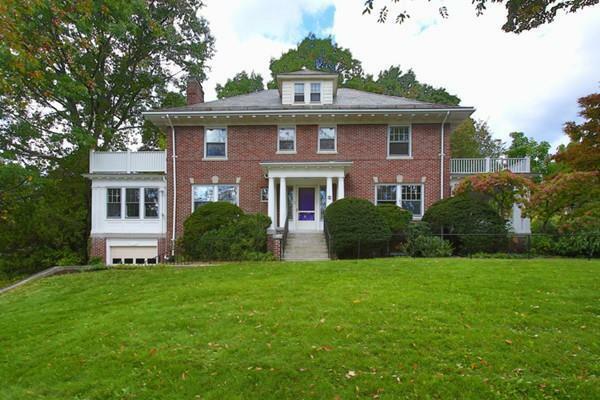 Magnificent center entrance Colonial perched on large lot where Adams Ave meets Shattuck Rd at the back of the Oakley Country Club. The William and Elizabeth Duncan House built in 1920 has been filled by a loving family and great memories for decades. The space is immense with high ceilings and large rooms. Ideal layout with three levels of finished and flexible living area. Off the inviting foyer to the left is the living room and sun room combination w/ double sided fireplace. Off the foyer to the right is the dining room with french doors opening to a covered porch. The kitchen opens to a full pantry and breakfast room. The 2nd floor includes the master bedroom w/ full bath, access to private deck, and walk in closet/dressing room. 3rd floor is family room or master suite w/ full bath. The new owner is left with the opportunity to customize this special home to their liking. Located 8 miles from Boston, 3 miles from Harvard Sq. Walk to Coolidge Sq, Arsenal Yards, Athena and Tufts!